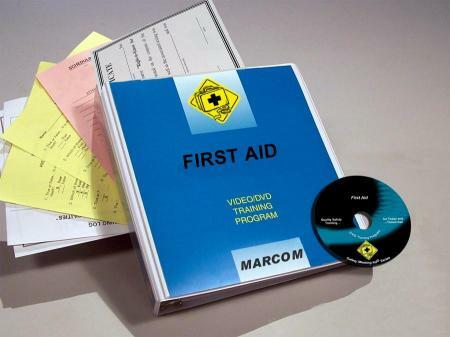 MARCOM's "First Aid" Video Program shows employees that knowing basic first aid can often limit the severity of any type of injury, or even prevent a death. In most facilities, not a day goes by without some type of injury occurring. It can be as serious as a chemical burn, or as minor as a small cut. But any injury can be painful and affect an employee's work performance... as well as their life off the job. The videotape includes information on cuts and bleeding, muscle pulls and sprains, burns, broken bones, shock, artificial respiration and CPR, automated external defibrillators (AEDs), and more. The video program comes with a comprehensive leader's guide, reproducible scheduling & attendance form, employee quiz, training certificate and training log.